Other Such Happenings: My boys are on the cover! Looky, looky who is on the cover of the February 2008 issue of The Heart of the Matter Magazine?! Don't you just love it?! I do! Even though my littlest man isn't in the picture (or even born when the picture was taken), this is my favorite pic of my two oldest boys. 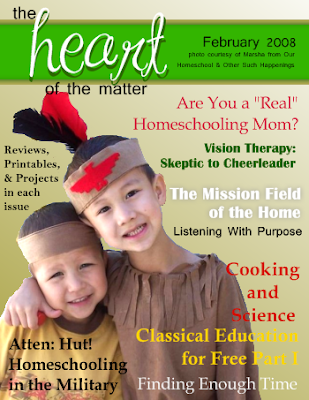 Click HERE to read the all new and fantastic homeschooling articles in this month's issue.